Atomic Tangerine - Guitar Projects and Music Stuff: Still for Sale - Jackson KVX10 with Hardcase. 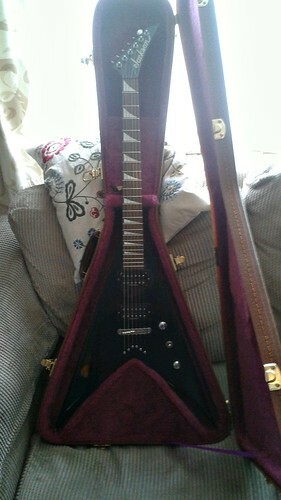 Still for Sale - Jackson KVX10 with Hardcase. Still trying to sell this, it's a pretty good instrument just not really 'me' any more. Email me if interested. I'm after £250 or thereabouts for it. I will consider dropping the price if the request is reasonable and you're willing to haggle. Demanding I knock £100 off and then refusing to budge will just make me judge you. I should point out, due to recent events, that I may take a little while to respond to emails regarding this. There are good reasons for this, I AM NOT A TIME WASTER just busy and occasionally too tired to think about stuff like this, and if a lack of instantaneous response causes you to lose interest at least have the manners to tell me so. All photos and writing copyright Doug McKerracher 2012. Picture Window theme. Theme images by sololos. Powered by Blogger.